Xilinx provides a comprehensive TUV SUD certified design flow solution for our customers to simplify and accelerate certifications based on functional safety specifications across Aerospace & Defense, Automotive, Medical and Industrial markets where safety and reliability are key. Certified Soft Error Mitigation (SEM) IP cores perform Single Event Upset (SEU) detection, correction, and classification for configuration memory. The cores utilize device primitives such as ICAP and FRAME_ECC to clock and observe the Readback CRC feature as part of the SEU detection function. For SEU correction, the IP cores perform the necessary operations to locate and correct errors. For SEU classification, the IP cores use Xilinx Essential Bits technology to further increase system availability. The Zynq®-7000 SoC has been reviewed and assessed for on-chip redundancy by TuV Rheinland. 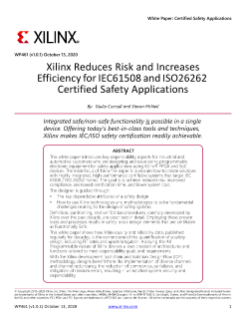 This Safety Concept Design study states Xilinx technology can be used to create a single chip solution that will support 2 independent safety channels for SIL3 safety functions referencing IEC61508 Part2 Annex-E. The Functional Safety Lounge provides access to solutions, documentation and additional resources to subscribers. For paid subscribers only, log in. The Xilinx Functional Safety Working Groups (FSWG) are an annual FREE event in North America and Europe that brings together Xilinx Industrial, Automotive and Avionics customers, academic representatives, Xilinx Alliance Members and certification authorities to discuss the latest Functional Safety topics. The Xilinx Functional Safety Working Group provides an excellent forum for participants to learn from Xilinx’ functional safety leaders and where attendees can connect with their functional safety peers in the industry. Attendees will develop a better understanding of the industry’s safety requirements for today and tomorrow and learn about innovative and unique solutions coming from Xilinx. Don’t miss this chance to explore Xilinx’s latest technology innovations and solve your design challenges! 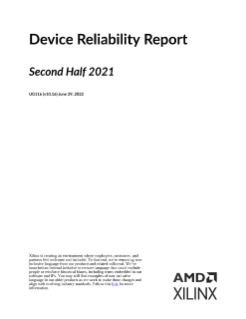 ALL PARTICIPANTS WILL REQUIRE CURRENT NDA AGREEMENTS WITH XILINX. If you have any questions about the event please contact, safety_solutions@xilinx.com. Individual access. Not valid for other members of the participant's company. No safety-related support. No refund for former purchasers of the Safety Package. 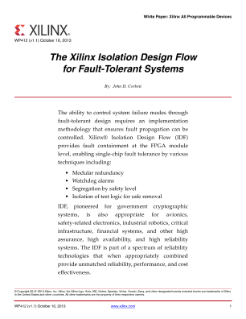 To be eligible participant must be accepted and attend one of the Xilinx FSWG events.